Nintendo slashed its earnings forecast by more than half Wednesday after announcing that its 3DS game machine, packed with glasses-free 3-D technology, won't be ready to go on sale for Christmas. Nintendo now expects 90 billion yen ($1 billion) in profit for the year through March 2011, down from an initial projection of 200 billion yen ($2.4 billion) profit. The 3DS will go on sale in February in Japan, and March in Europe and the U.S., missing the year-end shopping seaon which is a critical time for all game-makers to rake in profits. Kyoto-based Nintendo Co. had promised the 3DS for sometime before April next year, and so the announcement is not technically a delay. But its forecasts had assumed the machine would on be on sale sooner. Nintendo said the strong yen, which reduces profits from overseas sales when brought back to Japan, and the timing of the 3DS launch were behind its decision to lower projections for the fiscal year. For the year through March 2011, Nintendo expects to sell 23.5 million DS machines, including 4 million 3DS, down from its earlier forecast for 30 million. It sold 27 million DS machines the previous fiscal year. The latest revision shows that even Nintendo, which has stood up fairly well among Japanese exporters in hard times, is getting battered by the surging yen. Nintendo had counted dollar trading near 85 yen. The dollar has recently dived below 85 yen. Nintendo President Satoru Iwata said 3DS will cost 25,000 yen ($300) in Japan, where it will hit stores Feb. 26. Overseas prices and specific dates will be announced later. Hirokazu Hamamura, president of Enterbrain Inc., a major Tokyo game-industry publisher, said he was surprised by the release date because of widespread rumors the 3DS would hit stores in time for year-end and New Year's - a booming shopping time in Japan because children get cash gifts from relatives during the holidays. He said Nintendo is likely taking time to perfect the technology, as well as giving more time to outside software developers to come up with games. "There is an element of awe in 3-D that's really important for games. They are all about entertainment," Hamamura said. The portable machine looks much like the DS machines now on sale, and has two panels. The top panel shows 3-D imagery, giving players a relatively immediate illusion of virtual reality - such as a puppy licking the screen that appears to live inside the machine. The 3-D games don't require the special glasses that are needed for 3-D theater movies or 3-D home-console games like rival Sony Corp.'s PlayStation 3. They also don't need 3-D TV sets. Iwata said the drawback for 3-D technology was that the appeal of the feature can't be conveyed easily in TV or magazine ads. Fears have also been growing about the health effects of too much 3-D as some people have gotten sick looking at 3-D movies or playing 3-D games. "We are not taking the success of the 3DS for granted," Iwata told reporters at Makuhari Messe hall in this Tokyo suburb. "The value of the 3-D experience can be understood only by getting people to try it out." Nintendo said that several 3-D games were in the works including its trademark Super Mario games and "nintendogs + cats." Outside game developers were also preparing products, such as a 3DS "Biohazard" from Capcom Co. The 3-D handheld version of "Metal Gear Solid," from Konami Digital Entertainment, shown to reporters on the machine as a demonstration movie, but not in playable game form, presented vivid animation of jungle scenery, buzzing bees and a warrior's hands, all in 3-D, inside the tiny screen. 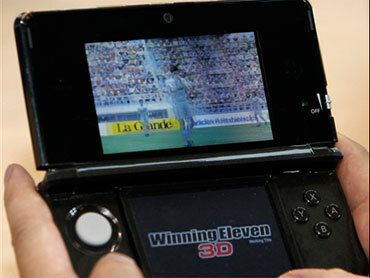 The 3-D feature is adjustable by a button at the side so players can choose the amount of 3-D razzle-dazzle they want. Nintendo said that wireless technology packed in the 3DS will allow owners to automatically communicate with passersby who also have 3DS, allowing them to trade avatar figures and combat each other in fighting games. Nintendo did not disclose details of the wireless technology, but Iwata said it was beefing up connectivity for 3DS at Japanese fast-food chains, train stations and other spots for social networking as well as gaming. Nintendo was among the earliest developers of 3-D technology. Its Virtual Boy, which went on sale in the 1990s, bombed, partly because of the bulky headgear required as well as the image being all red. Iwata acknowledged that failure but said the company had learned from past mistakes. "Players will be able to move freely around in virtual gaming space with our new 3-D," he said.